Between 05.02.2018 and 08.02.2018 three deck hous sections with a weight of up to 2,000 tons per unit for the newbuilding "W.B. 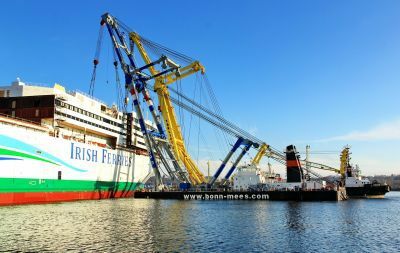 Yeats" were installed in Flensburg at Flensburger Schiffbau-Gesellschaft (FSG) by dint of the floating cranes MATADOR 3 and TAKLIFT 4.The "W.B. Yeats" is the biggest vessel ever built in Flensburg. 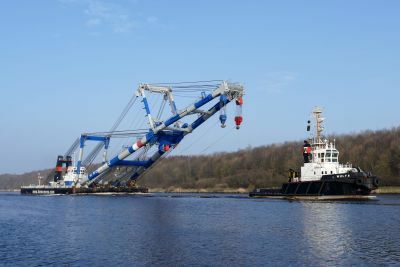 The floating cranes were assisted by our tug WULF 9 which towed the MATADOR 3 from Rotterdam to Flensburg, acted as assisting tug in Flensburg and also towed the floating crane from Flensburg to Cuxhaven. 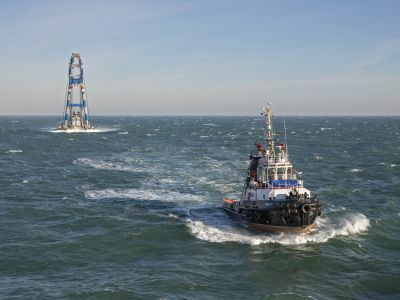 After a short stop due to wheather the MATADOR 3 was towed to Rotterdam by our tug WULF 7.